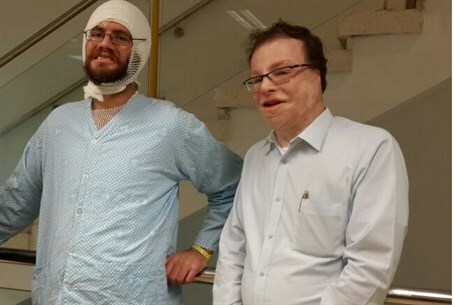 A unique visit occurred on Sunday when Deputy Jerusalem Mayor Dov Kalmanovich, himself a firebomb attack victim, came to the Sheba Medical Center to visit the parents of 11-year-old Ayala Shapira, who was critically wounded last Thursday in a firebomb attack. Ayala's father Avner was also lightly wounded in the attack that occurred as the Shapira's car was bombarded by a Molotov cocktail on a road outside Ma'ale Shomron in Samaria. The two Arab terrorists who committed the attack were arrested the night of the attack by the elite IDF special ops unit Duvdevan. Kalmanovich was wounded in the First Intifada that spanned from the late 1980s to the early 1990s. As a result of a Molotov cocktail attack, he suffered burns on 75% of his body. "As chairperson of The Terror Victims Association I visited hundreds of families of wounded and bereaved families. But this incident is closer to my heart, even more than usual," said Kalmanovich. Explaining the reason, Kalmanovich noted that like the Shapiras, he was wounded by a firebomb attack hurled by young Arab terrorists on his car as he returned to his community, and like Ayala suffered serious burns and had a long rehabilitation period as is anticipated for her. "I wish her a full recovery in the very near future," said Kalmanovich, who tried to comfort the parents by noting that it is possible to return to normal life even after such a horrific attack. Ayala underwent a successful surgery on Saturday and her condition has stabilized; the public is asked to continue praying for the complete recovery of Ayelet bat Rut. "It's hard to see it when you're dealing with the wound. There's a long rehabilitation process, which includes physical hardships and no less important emotional (hardships), which accompany the wound which is also difficult aesthetically," said Kalmanovich. "But if I, with 263% disability function almost completely normally, I am certain that heroic Ayala will return to full function and live a normal and happy life," continued the deputy mayor. Kalmanovich spoke after meeting Avner about the strength he felt while speaking with Ayala's parents. "I found in them strength and optimism. They are very very moral people, and their great spiritual strength will be an important part of the healing process," he said. The deputy mayor also had strong words of criticism for the security system, saying "the events that we are experiencing in recent months are an intifada by all measures." "The meaning of intifada is a national uprising, and children who hear incitement and take a lethal weapon in their hands like a Molotov cocktail, or car attacks like we experienced in Jerusalem - that's an intifada," said Kalmanovich. "The security system has to pick up the hint, so that it can use the proper tools in dealing with this kind of uprising." Avner himself leveled criticism after the attack, saying "all of this treating the incident as if it were a criminal event - the idea of treating some young criminals who throw bombs at cars as criminals is a fundamentally flawed concept." Likewise Otzma Yehudit chairperson Dr. Michael Ben-Ari last Thursday night drove to the site of the attack from his home in neighboring Karnei Shomron, and revealed that his daughter studies at the same school as Ayala. "The government of Israel has some guilt in this matter," charged Ben-Ari. "It has guilt because whoever frees terrorists essentially tells them 'you aren't murderers, you are freedom fighters. Kill Jews, burn girls, blow up buses and go home. Because you're freedom fighters.'"